- Model Building—Military, Vehicles, Figures, Ships, Aircraft, & More! - Model Railroads—Plastic, White Metal & Brass Kits-no more soldering! - And Industrial Applications, too! 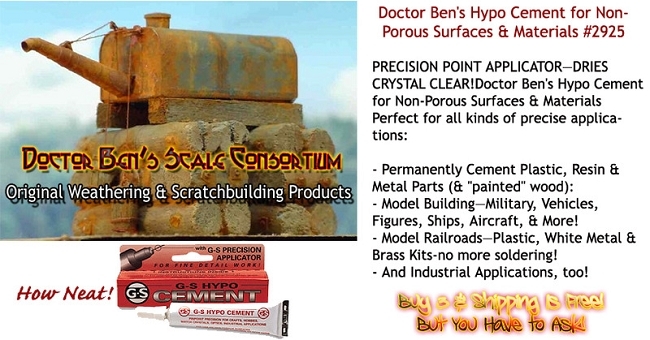 I personally have been using this product to assemble all those plastic Jordan kits and white-metal SS Limited/On-Trak/Wheel Works kits you see on the great dioramas that I build as well as a bunch of resin kits for at least a couple of years now. 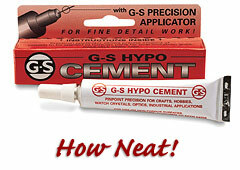 Anyway, Doctor Ben's now handles the G-S Hypo Cement for non-porous materials . . .
-Model Building—Military, Vehicles, Figures, Ships, Aircraft, & More! 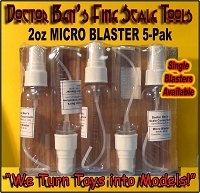 -Model Railroads—Plastic, White Metal & Brass Kits-no more soldering! -And a bunch more materials including Industrial Applications (I used it to repair the sandpaper on my bench sander the other day)! For as long as I can recall my personal preference for gluing plastic vehicles, figures, white metal kits had been CA glue with a micro fine applicator. The problem? First, old habits are hard to break. Finally I got fed up with the micro fine CA tip clogging and needing a third hand to shoot the Zip Kicker at the two parts that I am holding together with my remaining two hands—I'm getting too old to pull off this trick anymore. Another thing that I really do like about the G-S Hypo Cement besides the teeny, tiny nozzle applicator is that the cement does NOT dry rock hard—hard, but still pliable. How many of you have dropped something that is CA glued together model & had it shatter like glass? - Flatten tube as you use it up; do not roll it. - Insert cap wire when not in use. - Clean needle-point area with rubbing alcohol before closing cap.